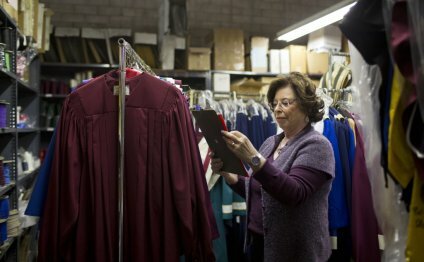 Choices include the Anthem Choir Robe with cuffed sleeves, or the Tempo Choir Robe with open sleeves. These stock Choir Robes are available for Qwick-Ship delivery. For large orders give us a call us for reduced quantity pricing discounts. The Tempo Design offers grace with its flowing lines and open sleeves. It also allows for more air circulation, so your choir stays cooler. The Anthem Design features adjustable Velcro cuffs that keep sleeves in place, even when arms are raised. Linen, chianti, sapphire, black and white. Tailored in durable Viva fabric with a soil release finish, both robes feature a comfortable "V" neckline, balanced machine fluting, deep hems and generous front pleats on each side of the guaranteed zipper closure. NOTE: Images show robes with coordinating reversible stole, which is sold separately. All choir robes are stocked in 18 different sizes, including several Junior sizes with matching Junior Stoles.